Coffee cups come in a variety of sizes, usually suited to the type of beverage you are having. Some coffee chains have their own fancy nicknames for sizes, too(I’m looking at you, Starbucks!). If you really want to boost the coffee experience from just your regular mugs to authentic coffee servings, read on! How many ounces in a cup of coffee? how many ml? The table above lists the most common sizes for coffee cups and the best coffees to enjoy in those sizes. Espresso is a very strong preparation and is thus enjoyed in much smaller quantities – so the 4 oz espresso cup size is more than enough. If you want to be really classy about it, espresso cups are called demitasse cups. A 6 oz cup size is ideal for enjoying cappuccinos. Cappuccinos are espresso shots mixed with foamed milk. Since the size of the espresso shot is standard, it’s important to control the amount of milk you use in the cappuccino, otherwise your coffee can get too milky and lose its strength, and end up being a latte. 8 oz cups are awesome standard coffee mug sizes, great for a fresh preparation of your favorite filter coffee or latte. Most standard coffee mugs are indeed 8 to 10 ounces, the best size for enjoying a pot of coffee. 12 ounce cups make for great iced coffee. As it is, you’re going to need a lot of ice, which will take up a lot of volume, so the larger cup can mean you still get a good quantity of coffee! 16 ounce cups are the big leagues, for serious caffeine consumers! The most common coffee cups, as noted above, are 8 ounces, or 227 ml. To figure out how big your favorite mug is, just fill your mug up with water all the way and tip it out into a measuring cup. Why does the size of your cup matter? A standard cappuccino is one shot of espresso and foamed milk. If you order a large cappuccino and don’t specify whether you want a double shot of espresso, you’re going to get more dilute coffee since there will be more milk to fill the top of your cup. Of course, if you happen to prefer milkier coffee, then by all means, go for the larger cup with a single shot! This also presents a really nice opportunity for you to try different combinations and see what flavors work for you. Remember, the size is just one way of modifying the flavor – you can try a stronger, darker roast with a larger cup for a more balanced coffee, or use a smaller cup with a lighter roast to get more kick out of it. What about for my home? The whole shpiel above was more for ordering coffees at your local cafes. If you’re looking to buy a good cup for home, then a standard 8 oz mug should do the trick since you can enjoy cappuccinos, lattes, flat whites, and filter coffee – 8 oz is the goldilocks amount! If you are really into espresso and considering getting an espresso machine, then I’d suggest you pick up some demitasse cups just for enhancing the espresso drinking experience. When you go to your neighborhood Starbucks, you’ll usually order a coffee sized by their fancy names: short, tall, grande, and venti. 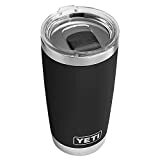 You’ll find that most of the bestselling travel mugs on Amazon are quite large, 16 ounces and 20 ounces. Presumably, this is for grabbing a hit of filter coffee for the road. Since the mugs are insulated, you can actually pour out two whole servings of coffee that will last you a lot longer! We’ve been talking a lot about cups and ounces, so I thought it would be useful to include the standard cup size as well. The cup used as a measure in the Imperial system is actually two types: the legal cup and the customary cup. These are the measures used in cooking, and to keep things uniform and convenient, I suppose most coffee cups are also the same as the “cup”, or 8 ounces.